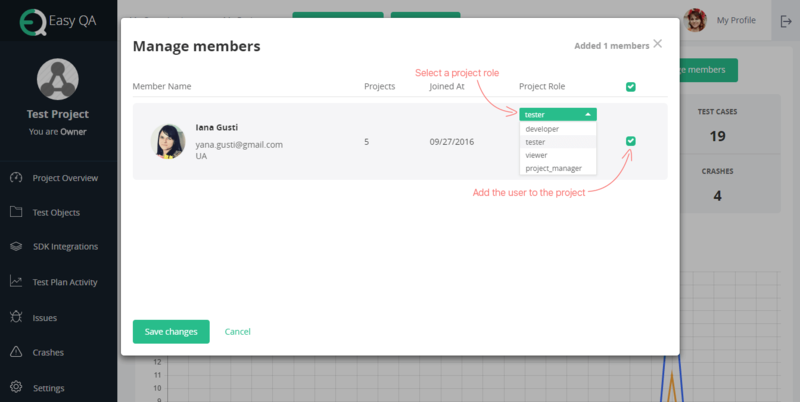 To manage projects with EasyQA, you have to create them within your organization. Let’s take a look what is a project. Project – is a temporary endeavor which might have a certain beginning and finishing date, and might be determined by certain financing or achievement of certain goals, to reach a unique target and tasks usually bringing profitable changes or additional value. After creation of an organization, the user is able to create and manage projects that are working on a product. You can do it simply with EasyQA test management tool as it has been developed by UX developers’ team. A user can create a project from any page by clicking on Add Project on the navigation bar at the top of the page or on the Projects tab of a certain organization. To create a project a user has to choose an organization and enter the title of the project. If you are an admin of another organization – you can also create a project for it. Multi-variable logo adding makes EasyQA usage most efficient. A user can add or replace a project logo in several ways – with drag and drop or by pressing on a logo area. The development is being made on the basis of one or few of the platforms (Android, iOS, Web). Those check-boxes are informative, they do not change the functionality which the user use to manage projects, they help you with search and sorting of your projects. EasyQA allows the user to not choose a platform during a project creation. You can select them later on the Settings page during the project editing. After a project creation was completed, you can find all your projects on My Projects page. There is the list not only of projects for which you are an owner. My projects page contains also those project to which you were added by the owner or admin of another organization. On this page the user can search a required project by the name. EasyQA development team has implemented a sorting function by a platform you have chosen when you created a project. The team is the most important part of the project and the correct people’s arrangement is significant. You can do this by clicking on Manage members button on Project Overview or Settings page. Select a project role from the drop-down list for the user you want to add to the project and choose a check-box near him/her. Users can also turn on notifications and get emails on all actions connected with them in the project. EasyQA test management tool is a very adaptable project managing platform combining simple usability and a great functional flexibility to make your project the most successful.